I like to consider myself one of the “official birthday bakers” of my family. There are a lot of people in my family, and that means a lot of birthdays. There’s nothing better than presenting someone you love with their favorite treats to celebrate another year of being family. If you’ve been following along the last few weeks, you know that Eric, Elle and I are planning to make the move back near where I grew up. We really want Elle to be near all her grandparents, uncle, great aunties, and cousins. Plus, if Eric and I are being honest, we’re kinda tired of making that hour and a half drive each way every single time there’s something to celebrate – like a birthday or a Browns game. I can tell you right now, it’s not fun to transport desserts in a car with two dogs, and it’s also not fun making them in a kitchen that isn’t your own. Luckily, the prevailing birthday treat in my immediate family isn’t cake or cupcakes.. it’s cheesecake. And cheesecake can transport like a champ – especially when they’re cute mini cheesecakes like these. Did you know that September is the most popular birthday month? Guess there’s just something about December 31st that makes people happy! September also happens to be the McCormick Spice Company’s official birthday too. Talk about gettin’ spicy. McCormick asked if I’d like to share with you some of my favorite birthday flavor stories, and around here, that flavor is 100% cheesecake. Smooth, velvety, vanilla-infused cheesecake that’s heavy on the salted caramel sauce. Almost every birthday, for as long as I can remember, has always been about cheesecake. When three out of the four people in your immediate family are addicted to the stuff, it’s pretty much a no-brainer that that’s where you’ll plant your birthday candles instead of a plain old yellow cake (or even the best chocolate cake). Every year has been about topping (literally) the previous birthday’s cheesecakes. I have so many great memories of all the scrumptious cheesecakes we’ve made over the years, especially when my Nana was still alive. I’ll be sharing her famous cheesecake recipe very soon, so stay tuned. My mom and Jared were all over this Salted Caramel Cheesecake. My mom even proclaimed it to be the best cheesecake she’s ever eaten and let me tell you, we’ve eaten a lot of cheesecake. Topped with salty caramel and a chocolate drizzle with chocolate graham crumbs for the crust, this cheesecake is the definition of birthday celebrations in my family. bourbon-y flavors, making it extra perfect for Salted Caramel Cheesecake. To celebrate their birthday this month, McCormick is igniting a conversation around birthdays and asking people to share their favorite birthday flavor story – maybe it’s a memorable party, an unforgettable birthday cake, or the best gift you’ve ever received. So tell me, what’s your favorite birthday story? Tell me in the comments below, or on Facebook and Twitter using the hashtag #FlavorStory. In a small bowl, combine chocolate graham cracker crumbs and butter, mix until combined. Press crumbs onto the bottoms of the lined muffin cups. Bake in preheated oven for 5 minutes. Remove pan to a wire rack to cool while you prepare the cheesecake filling. In the bowl of a stand mixer fitted with the paddle attachment or in a large bowl with an electric mixer, beat cream cheese for about two minutes. Add in sugar and mix for another minute. Add eggs and vanilla, beat well. Be sure to scrape down the sides of the bowl to ensure the batter is thoroughly mixed. Spoon batter into each cup (about 3 tablespoons), filling each 2/3 full. Bake 22 to 24 minutes or until centers are almost set. Cool in pan on wire rack. (Mini cheesecakes will deflate in center upon cooling.). Before serving, spoon 1 heaping teaspoonful of salted caramel sauce onto each mini cheesecake and drizzle with melted chocolate. Salted Caramel Cheesecake can be covered and stored within the refrigerator for up to 3 days. Disclosure: This is a sponsored post written by My Baking Addiction on behalf of McCormick® Extra Rich Pure Vanilla Extract. The views and opinions expressed on My Baking Addiction are purely my own. Craving salted caramel? Check out these delicious recipes! I LOVE these gorgeous mini cheesecakes! 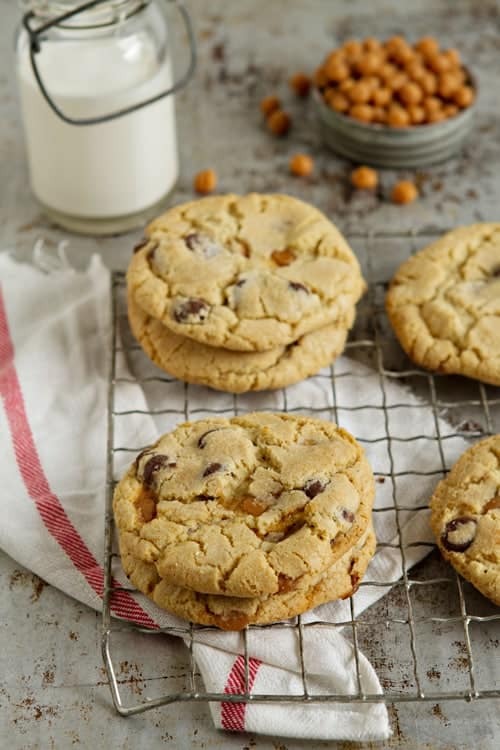 The addition of salted caramel is out-of-this-world! I am in love with how cute these are. Homemade salted caramel sauce on these just takes them over the top! So adorable! And those flavors — OMG! They are addictive, Kristan! Thanks so much for stopping by! Thanks so much for stopping by, Gerry! These look amazing!!! I want a couple now! These little cheesecakes are completely adorable! I love the addition of the salted caramel. And your photos are gorgeous as always! I have a September birthday, and I’d gladly eat these as my birthday cake!! And I live within 30 minutes of all of my family and I wouldn’t change it for the world. It really is the best to be close to family. Thanks so much for stopping by Deborah! It’s tempting isn’t it? Thanks for stopping by Karly! These looks amazing Jamie! Perfect for the fall! Thanks so much for visiting Marla! Cheesecake and salted caramel are two of my very favorite things!!! Love everything about these delicious cheesecakes!!! Thanks so much Jocelyn! I appreciate you stopping by! I could eat more than my fair share of these! I love little desserts like this. I need the help with portion control! 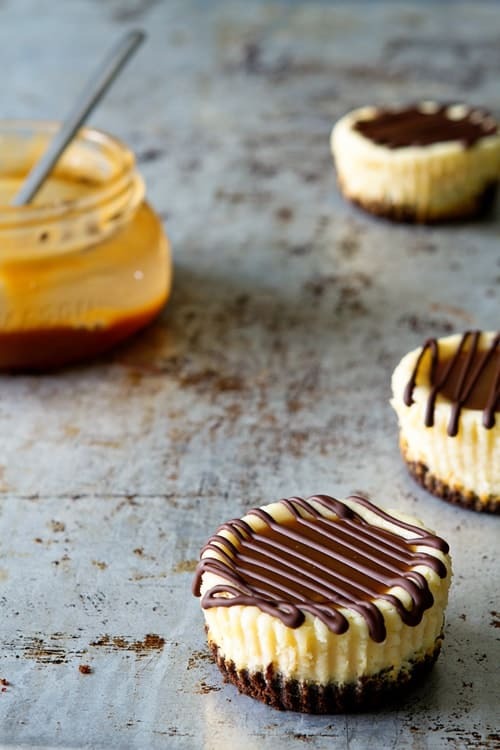 Oh, my gosh, these mini-cheesecakes look extraordinary!!! I’d certainly gobble up more than my share!!! These are so lovely. I’m on such a salted caramel kick right now!! Thanks so much for stopping by Aimee! Extra rich vanilla extract sounds right up my alley. These are perfect cheesecakes! Thanks for stopping by Cassie! These are just amazing! They are perfect for holiday parties! Thanks for stopping by Sommer! I love cheesecake, but when you make them mini, I REALLY love cheesecake. My kids are going to love these! i would love to try this but what if i don’t have the graham choc cracker and the extra rich pure vanila, can i subtitute with the ussual vanilla extract? And can i subtitute the cracker with oreo maybe? Thank you.. And your cake does look delicious.. Both of the substitutions will work just fine. Thanks for visiting! These look so yummy! Craving them right now. Just a quick question… How many cups would the crushed graham make? I usually buy a pack of graham that’s already been crushed so wondering what the 9 sheets would be equivalent to. Thanks! I think it will be just a tad over a cup. Sorry, I didn’t even think to measure them that way. Thanks for stopping by! Thanks so much for stopping by, Shubila! Can I make you my official birthday cake maker too? ;) I’m all about this salted caramel cheesecake – especially because they’re so darn cute! I can totally see why you are the official birthday cake maker! These cheesecakes look awesome! Being close to family is awesome, so excited for you! Also, I want these adorable cheesecakes every year for my birthday! Thanks so much for stopping by, Tessa! Cheesecake is one of my favorite things to make for family functions for exactly that reason! The salted caramel topping makes it extra delicious. Plus I love the cupcakes v. the whole cake! Hi Jamie, thank you for sharing your recipe! Your end products look so amazing but mine was nowhere near :( I baked it for 20 mins only because the top has cracked open, some were a little charred, the texture was smooth and creamy like yours. Kinda wrinkled and it doesn’t deflate after cooling. Pls help me out here, thank you! I’m sorry for your trouble with the recipe. It could be your oven temperature. Oven thermometers are available at most hardware stores if you would like to test your oven temperature. I hope this helps! That is perfection!!! Mmmmmm salted caramel! These look great. I’m thinking of taking some to work. Should the caramel be served warm? I was just thinking of heating some of the caramel (via microwave) before placing it on the the cheesecakes. Hi! Thanks for stopping by. I actually topped them, refrigerated them overnight and served them with cold caramel, they were delicious! I just made these and I am starting to assemble! So far the taste test (I snuck one) is amazing but how did you get he caramel sunken into the middle? Did you remove some of the cheesecake or indent? Yours look amazing!!! The cheesecake should indent a bit upon cooling, then I simply poured the caramel into the little divot. I hope this makes sense and it helpful. Thanks for stopping by! Hi Jamie! 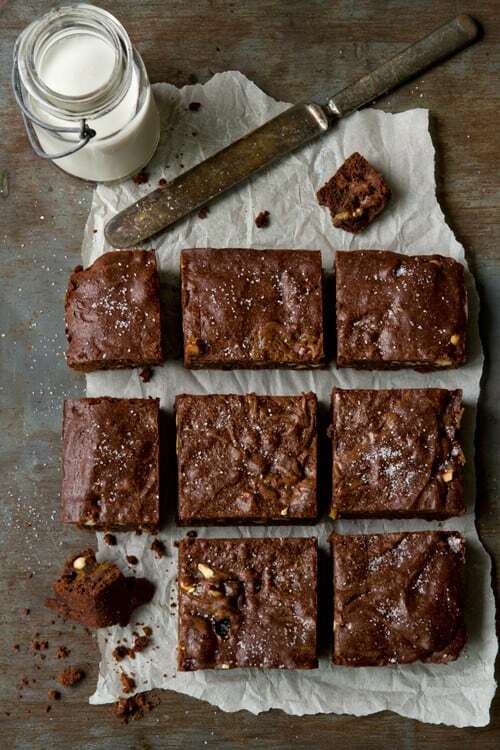 This looks amazing and I’m a salted caramel junkie so I’d love to try the recipe. Not having baked a cheesecake before, but having read lots of recipes, I was wondering whether you forgot to add the bain marie part or if they really bake just like that… Could you please confirm? Also, I’m not sure I could find Graham crackers in Switzerland, where I live, so would you have any suggestions for a substitution? I skipped the bain marie for these mini cheesecakes. 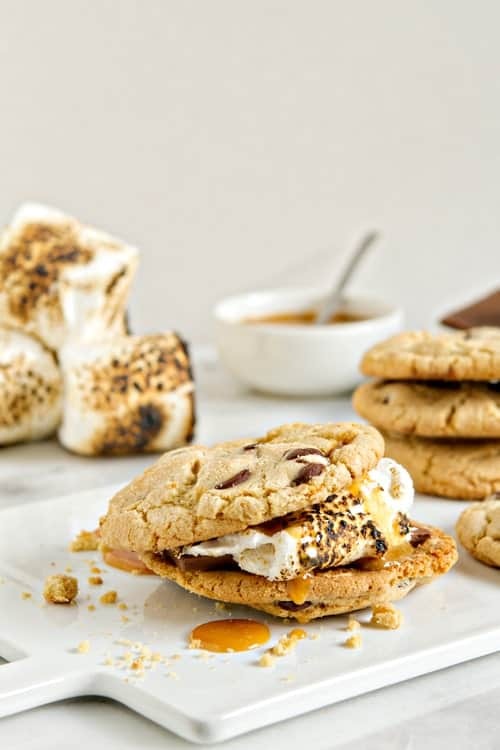 You could substitute a shortbread cookie or other crisp cookie for the graham crackers. I hope this helps. Making these tonight and just had a question about the cupcake size. It says mini, but I am not sure if that’s just because they’re small cheesecakes, or because you are actually using a mini cupcake pan. If they are in the mini pans, it seems like you would get more than 12 with that amount of batter. Please clarify! Thanks!! These are made in a muffin tin, not a cheesecake or mini cheesecake pan. I hope this helps. I halved the recipe and made these in mini muffin pans–so cute–and got 32 really bite-size cakes. For the salted caramel sauce, I used Cookies and Cups’ microwave recipe, which was really easy. In the smaller size, they didn’t sink in the middle. I filled the cupcake liners almost full an dbaked them at 300 in a convectin oven for 15 minutes; they puffed up and then flattened. No depression in the middle but the sauce did stay on. How did you get such a perfect drizzle, Jamie? I put my melted chocolate into a baggie and snipped the corner, but my lines were uneven. More practice necessary, I guess! They still tasted great and looked pretty good. Oops, I meant convection oven!! how much are the graham crackers in cups? About a cup of graham cracker crumbs. I hope this helps. Just put these in the oven for the second time. Easy and delicious. One-fourth cup of the cream cheese mixture is a perfect measurement and easy to add into each paper lined muffin cup. 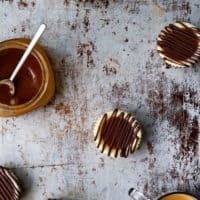 Making the homemade caramel sauce is so worth the effort. 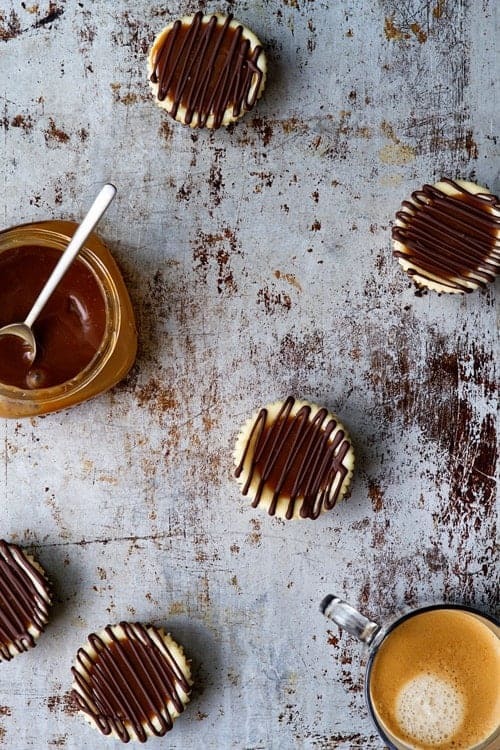 Just follow directions for the Salted Caramel Sauce and you cannot go wrong. When ready to serve, I melt some of the caramel sauce and drizzle over the cheesecakes that I’m serving. Yummy and a big hit. i loved making the mini version but was wondering if this same recipe could be used for one whole cake instead? Hi, Melissa! I’ve never tried it, but I think this recipe would make a smaller sized cheesecake. Let me know if I can help with anything else! Love cheesecake anything & salted caramel!!! This minis are a tasty treat of delish delight!!! Mmmm!!! I want one!!! I hope you enjoy it, Ganesh! You’re so welcome, Josee! I’m glad to hear that! Could these made in the small, individual cheesecake pans rather than muffin pans? Hi, Pam! They probably could be. I don’t know if you mean the individual cheesecake pans that resemble the muffin pan or individual springform pans, so the baking times would probably differ. I hope you enjoy them!